Click the Link below to see the Local Cable News TV story about this training, or right-click and save to your PC. Firefighters practiced operations in the Dutchess Mall in Fishkill Thursday night. Mike Flynn, center, from the Rombout Fire Department, is the lead firefighter on the hose. 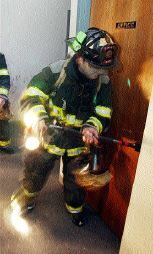 Ron Corrado of the Fishkill fire unit pries open a door during training. FISHKILL – After bursting through the glass office doors, a half-dozen firefighters quickly dropped low, crawled through the dark entry hall and down a tight hallway as if heavy smoke and heat were battling them back. But the unused office at the soon-to-be demolished Dutchess Mall wasn’t ablaze Thursday night, and the fire source being tracked was imaginary. The exercise was part of a series of firefighter training events being held at the mall this week. Organized by the Rombout Fire Department, Thursday’s training drew about 100 volunteer firefighters from nine local departments. '’It’s proven to be everything that we expected,’’ said Rombout Fire Chief Jeff Marino, who spent two years working with the property owners to be able to train in the mall before it’s torn down. Marino, who praised The Dagar Group of Fishkill and Hudson Properties LLC for donating the structure for the training, said the 250,000-square-foot space is probably the largest ever used for training in Dutchess County. With dozens of empty stores, the volunteers have been able to practice search-and-rescue techniques, forcible entry and other firefighting exercises in realistic conditions. The Beacon Fire Department, like several of the other departments on hand, brought a few rookie firefighters along. Some of the scenarios included rescuing firefight-ers, Rombout first Assistant Chief John Lucariello said, stepping around shattered glass to point out the large holes and damaged metal studs from the exercises. Because the mall is going to be demolished, firefighters were able to practice destroying things such as the metal gates many commercial businesses use for security, Rombout public information officer Kevin Barry said. It’s also a chance to practice radio communications and basic firefighting, such as stretching fire hoses into buildings, he said. Barry and others watch-ed as another group of firefighters burst through the office doors, this time lugging a heavy, water-filled hose. The group struggled to pull the unwieldy hose around the hall corner, staying low the whole time. '’These are perfect conditions for this,’’ Barry said.